Here's a screenshot, from the journal of Doctor Townkill, lol. That is not a screen shot from in game showing my character. You could easily write that in a journal log, I could write in anything I wanted in front of your name. This proves my point that you are dedicated to trolling new players and disrupting this shard. Photoshopped or not, look at the time this person has spent to mess with a someone who only wishes to start a new character. I believe this is harassment and a ban is in place. If anything less you can be considered trash of the shard and we can all collectively wish you the worst. There's nothing worse than a rat. I hope you're enjoying your time here. Lie to me and tell me that it's fun responding to hate messages on forums and trolling new players with the exact same "gate purple pot" strategy. I have had it easy training my character and exercising my keyboard in a few seconds of my boredom here, while collectively making new friends. We both know you're a sad and depressed individual who likely needs help in real life. Good luck! I truly feel sorry for you. It's bad enough you're spending your time in a 20 year old game, it's even worse that you've been maxed out for quite some time and can't compete with other PVPers. The worst of it all is you can't seem to find anything to do but grief others in a pathetic and hopeless manner. Townkilling in conjunction with dual banter isn't bannable. That's called dialogue. I had no idea the collective 4-5 minutes total I've spent townkilling this guy would result in such a blessed gift. This is sensational. and to the ecag kid or whatever his name was - I'm glad I could help you out in some way. You seem to have absolutely no life and are completely depressed. I'm here for you if you need help, not even joking. BTW I've been AFK all morning and finished my magery gains. I'll be in my house to finish off resist. You're blue so I suspect you can't even find enough in town players to gank. Sad, Sad, Sad. Maybe you should try moving the goal posts again, it seemed to work for you the two previous times. Bonus points for going straight to IRL attacks, by the rules of the internet I declare Fake the winner of this thread. Oh boy, didn't this 'go south' rather quickly ... ? I'd rather that Resol accept this as a learning experience, and stick it out here (Cripes, WHAT? Flamestriking self in Town for Magery gains ... then getting town-killed ... and then this elaborate gripe on the forums ... OMG, no, why?). One thing set ME off: the incomer's recurrent use of the term "trammy". Resol, I do not condone the behaviour of town-killers but, "Good God, man! ", find yourself a spine. BTW, I know for a fact that FakeEcaj is the most-unskilled-wannabe-PKer-ever: I was 3-clienting a Lvl 4 Treasure-map chest, and this idiot Revealed and tried to kill one of my toons (he, um, had that toon completely by surprise, I was playing another client, AND STILL FAILED TO DROP HIM); not only had we unearthed the chest, but we dry-sacked it, including spawn, and all came away home. Ever since, I have reserved a title for FakeEcaj: "FakeEcaj, the not-entirely-competent Executioner". Resol, stay, or don't: your choice. 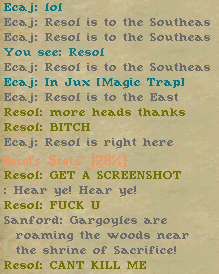 I side with Resol... Ecaj is has some chromosomal issues with no cure. Stuff like this is what makes UOSA awesome. That animated gif makes so much more sense now with the context of the forum post. I'm glad I read this. It brightened my day. Not really no. Makes it boring. It's like draining a pool, when all the water is gone all that's left is the sludge.